So far, all relevant system configuration has been done for us by the Install. Of course, you also want to do modifications to the system configuration later on. This is what the PBX Manager is for. and add it to your home screen (best in the Admin Tools group). When you open the PBX Manager App , you will find a number of icons. Each icon is known as a PBX Manager Plugin which are used to configure a component of your PBX or your App Platform. The exact type and number of such plugins depends on the PBX firmware (all the "black & white" plugins are provided by the PBX) and the Apps you have installed (all the "coloured" plugins with an AP prefix are provided by the installed Apps). This book will only focus on the trunks plugin, while other plugins will be explained later on. 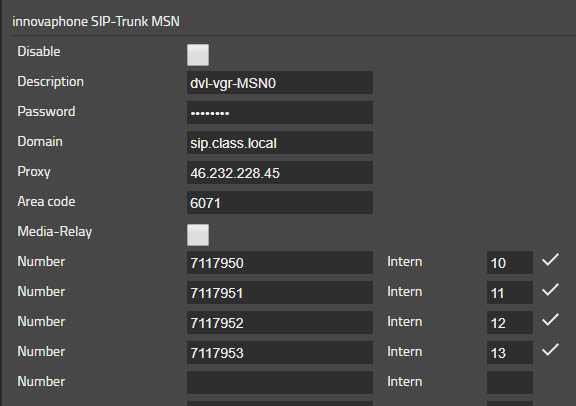 The Trunks PBX Manager plugin has one simple task. It should allow you to set up a trunk to connect your PBX to the PSTN. This can be achieved by configuring a FXO, BRI, PRI or SIP interface on one of your devices. Since we have no time to waste let's get straight to work and open our PbxManager App .
. The external line number is usually 0 but this can vary depending on your country or your needs. 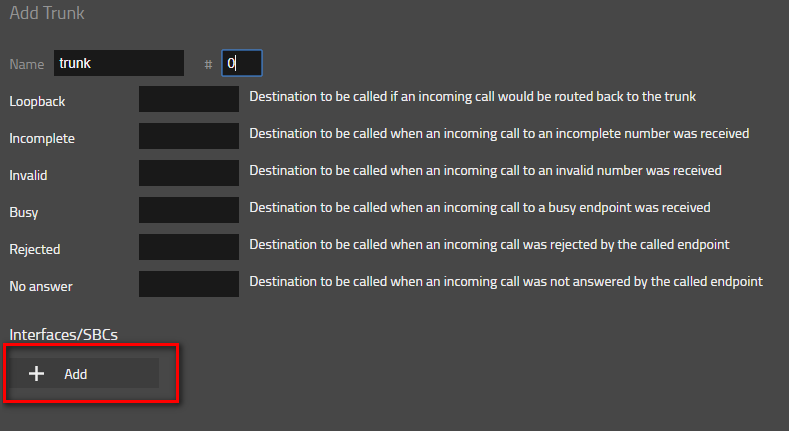 Additionally this section let's you set up any call forwardings for calls that pass through our newly created trunk but weren't connected or the destination is the number of the trunk itself (loopack). Those call forwardings are usually used to reroute calls to a central switchboard. We will discuss how to configure a switchboard later on in the course. For now let's reroute calls to Mario Rossi - 13. Afterwards you need to press OK.
As a next step we will select the newly created trunk and link the trunk directly to an Interface. Simply press the Add button and a list of devices will appear. At the moment we don't have much of a option consequently let's choose hq.invalid member reference '.domain' in 'domain'. Our next choice is Interface or SBC. In this context interface means that we talk about a physical interface to create an external connection with. This might be a FXO, BRI or PRI. Since Innovaphone gateways differ not all physical interfaces are present on each device. You have to choose the correct product according to your needs. SBC is an abbreviation for session border controller which is used to set up a SIP connection to your SIP Provider. You can either use the SBC functionality on the same device as your PBX or you can outsource it to a different device and place it in your DMZ.
. You can either choose to configure a direct dial-in trunk(DDI), which allows you to have a range of extension numbers which are accessible from the PSTN, or you configure a trunk with Multiple Subscriber Numbers(MSN). We are now going to register the SBC to a Provider. We are obviously not using a real provider with on uplink to the PSTN. We prepared a provider simulation running for you in Sindelfingen. You will need the follwoing configuration parameter to configure your SBC. As long as the disable flag is active the interface won't send a Register to the Provider nor will listen to an incoming SIP message. This is the number of the trunkline, which will be handed to you by the provider. In the previous step you had the possibility to choose the country of origin of your SIP provider if you remember. According to your decision the information is used to prepend the suitable country code to the number. The Innovaphone profile uses the german country code(+49). Furthermore the are code and the subscriber number of the trunk is configured here. In case you have no area code you can leave it empty. The username can have two uses. To identify your account at the provider and to authenticate your account. The username of those purposes can differ consequently there can be two different options to configure a username. This is pretty much self explanatory. The password is used to complete the authentication at the provider so no one else is using it. This option let's us define the domain part of a SIP message. In most cases this configuration is optional because a DNS lookup for the domain should return the proxy address. The proxy IP address is used as IP endpoint for the SIP signaling messages. By activating the Media relay flag you'll reroute RTP traffic through the SBC. Without the media relay flag RTP Traffic would be sent directly from endpoint(phone) to the provider and the other way round.. If you finished configuring it, it should look like this . If the registration was successful, you'll see an checkmark icon in the top next to the registered IP address. You will end up at a hotline. As soon as you lost all your money you can hang up. Now we are going to register the MSN Trunk to our Provider Simulation in Sindelfingen. To configure your SBC you'll need the following configuration parameters but before you do that I'd recommend to delete your DDI Trunk and start fresh. The Username is used to authenticate the SIP interface at the provider. The matching password to the Username completes the authentication. This configures the domain part of a SIP message. This is usually a subdomain of your provider. This configuration should be optional because a DNS lookup of the domain should retreive the proxy address. The Proxy is used as IP endpoint of the SIP signaling messages. Several countries subdivide the country into geographic regions. Numbers in those areas can be reached by a prefix which is the area code. A area code configuration might not be necessary in your country. The MSN number provided by your Provider needs to be inserted in this configuration parameter. To map a MSN Number to an internal extension number the internal extension number has to be configured here. By activating the Media relay flag you'll reroute RTP traffic through the SBC. Without the media relay flag RTP Traffic would be sent directly from endpoint(phone) to the provider and the other way round. In the end your configuration should look like this . Each MSN Number uses a SIP interface which registers separately at the SIP provider that's why you see a checkmark next to each successful registration. Of course you can dial 00049900999 or 00900999 if you want to reach the expensive hotline again like we tested our DDI Trunk but you can also try to reach one of your MSN numbers from one of your users. You could dial 000invalid member reference '.netcc' in 'netcc'invalid member reference '.netac' in 'netac'7invalid member reference '.nete164' in 'nete164'0 or 00invalid member reference '.netac' in 'netac'7invalid member reference '.nete164' in 'nete164'0 from Jean which will reroute the call to one of your users depending on the number map you configured. You might notice that the calling party number and connected number which are displayed on the phone only show you the MSN number without a country or area code. In real life you might expect an international or national number format. This is due to our Provider Simulation. You can ignore this for now.